We’d love your help. Let us know what’s wrong with this preview of The Backstagers Vol. 3 by James Tynion IV. The Backstagers are back in (stage) blacks, for a festive collection of Valentine’s Day and Halloween stories! 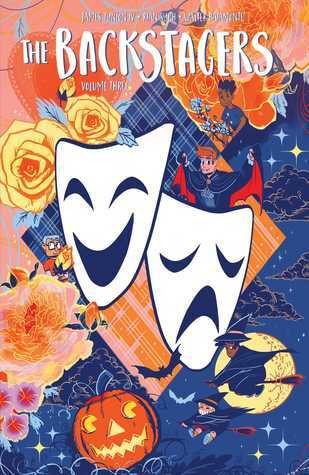 Join Jory and the rest of the Backstagers as they wrestle with anti-Valentine crusades, totally creepy phantoms (NOT of the opera), and the everpresent magic of the backstage All the world's a stage . . . but what happens behind the curtain is pure magic—literally! To ask other readers questions about The Backstagers Vol. 3, please sign up. Reading this installment was bittersweet for me. Even though the graphic novel itself was not sad in the slightest, it reminded me of when I worked tech, how fun it was, and how much I miss it. As for the graphic novel itself, the characters are still cute and funny, but still a bit one-dimensional. And the stories were a little goofy, but still fun. Feel the feels and the scares in this volume! I’ll read anything of the Backstagers-artwork and story line are as good as ever. There's a couple of really good stories here, but it's mostly fluff. Largely cute fluff, but fluff nonetheless. Prior to his first professional work, Tynion was a student of Scott Snyder's at Sarah Lawrence College. A few years later, he worked as for Vertigo as Fables editor Shelly Bond's intern. In late 2011, with DC deciding to give Batman (written by Snyder) a back up feature, Tynion was brought in by request of Snyder to script the back ups he had plotted. Tynion would later do the same with the Batman Prior to his first professional work, Tynion was a student of Scott Snyder's at Sarah Lawrence College. A few years later, he worked as for Vertigo as Fables editor Shelly Bond's intern. In late 2011, with DC deciding to give Batman (written by Snyder) a back up feature, Tynion was brought in by request of Snyder to script the back ups he had plotted. Tynion would later do the same with the Batman Annual #1, which was also co-plotted by Snyder. Beginning in September 2012, with DC's 0 issue month for the New 52, Tynion will be writing Talon, with art by Guillem March. In early 2013 it was announced that he'd take over writing duties for Red Hood and the Outlaws in April.